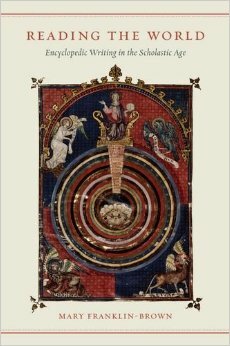 At a time when critical debate rages over the value of popular, open-sourced databases such as Wikipedia and their impact on professional scholarship, Mary Franklin-Brown’s superb book Reading the World redirects our attention to the comparable proliferation of discourses and heterogeneity of authority during the Middle Ages. With enviable lucidity and critical aplomb, Franklin-Brown returns to multi-lingual sources from the Scholastic Age, which she frames with theories of knowledge such as Foucault's, in order to show how this far-distant moment raises problems relevant to our own, unfolding the contradictions driving encyclopedism’s impossible project of containing all knowledge in a single book—of finding that one last object to contain all other objects. Franklin-Brown reveals the pages of medieval encyclopedias as sites of multiple fissures and interfaces that permit—indeed perhaps even demand—reading out of sequence, randomly and always partially. And yet, even as Reading the World reflects on the impossibility of “reading everything . . in a single book,” Franklin-Brown's book constitutes a singular exception to the discursive practice it studies, for it deserves to be read from start to finish.